Welcome to the Evidence Based Birth® Q & A Video on Eating Dates to Start Labor! Enjoy the video, and I hope you find it helpful! Stay tuned for our next Q & A! Want to submit a question for consideration? Hi. My name’s Rebecca Dekker. I’m a nurse with my PhD and the founder of Evidence Based Birth®. 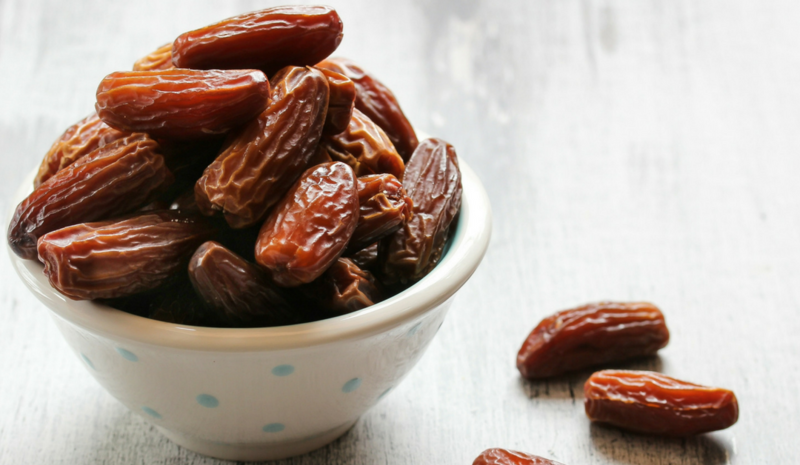 In today’s Q & A, we’re going to talk about eating dates to naturally induce labor. In today’s Q & A, part of our Natural Induction Series, we’re going to talk about eating the date fruit or Phoenix dactylifera to induce labor naturally. The date fruit contains a high percentage of carbohydrates and fats and also includes 15 different types of salts and minerals, proteins and vitamins, such as riboflavin, thiamine, biotin, folic acid, and ascorbic acid. Some Islamic scholars interpret verses in the Quran to mean that dates are one of the best foods to eat for childbirth. There have been three smaller randomized control trials on eating dates to induce labor and one observational study that asked women about how often they eat dates to induce labor. In one randomized control trial published in 2017, researchers included low-risk, first-time mothers who are giving birth at a hospital in Malaysia. They had to be at least 36 weeks pregnant and not have broken water yet and they had to be planning a vaginal birth. Seventy-seven women were randomly assigned to eat dates. They were given a supply of dates and advised to eat seven pieces a day until they started active labor or considered to be 4 centimeters dilated or until they scheduled an induction or Cesarean or had complications. Seven pieces of dates equals about 80 grams of dates. They were asked to record their intake on a diary sheet that was provided, and the control groups, 77 women who were randomly assigned to not eat dates were asked to abstain from date fruit intake, and they also did random blood glucose monitoring at their prenatal appointments. The researchers saw no difference between groups with regard to abnormal blood sugar levels, pregnancy duration, the onset of spontaneous labor, average cervical dilation when they were admitted to the hospital, or the Cesarean rate. However, the dates group received significantly less augmentation of labor with pitocin compared to the control group. Only 37% of women in the dates group needed pitocin augmentation compared to 50% in the group that did not eat dates. There were no other differences in maternal or newborn outcomes between the two groups. These researchers concluded that date consumption in late pregnancy might lessen your need for pitocin augmentation during labor and that it doesn’t seem to have any adverse effects. A second randomized control trial looked at the effects of eating date fruit in late pregnancy on the ripening of your cervix in first-time mothers. This trial took place at a hospital in Iran and included low-risk, first-time mothers who were between 37 and 38 weeks of pregnancy and planning a vaginal birth. One hundred and five people were randomly assigned to the dates group, and they were given 70 to 75 grams per day of date fruit to eat and asked to continue eating the fruit daily and recording their intake until labor began. The other 105 women were asked to not eat date fruit for the rest of pregnancy and labor induction was recommended if they reached 41 weeks of pregnancy. The researchers found that the women who were randomly assigned to eat dates had a more ripe cervix at admission. Their Bishop score, which measures cervical ripeness, was higher when they were eventually admitted to the hospital, and they were more likely to be more dilated when they were admitted to the hospital, 4 centimeters versus 3 centimeters. They also had a higher rate of vaginal birth after a labor induction. If they needed to be medically induced, they were more likely to have a vaginal birth than the group that did not eat dates, and that was 47% had a vaginal birth after labor induction versus 28% in the control group. Also, fewer women in the date fruit group needed pitocin for labor induction. Only 20% of them needed pitocin for a labor induction versus 45% in the other group. The researchers concluded that they felt that the date consumption in late pregnancy was helpful for cervical ripening. The third randomized control trial compared the effects of date fruit and pitocin in the prevention of postpartum hemorrhage. This was a really interesting study that took place at two hospitals in Iran and included 62 women who had just given birth. It was a small study, but it was really interesting and probably could be used as pilot data for a larger study. After the birth of the placenta, 31 women were randomly assigned to receive dates. They had to eat 50 grams of dates orally after the placenta was born. The other group was randomly assigned to receive oxytocin or pitocin, and they were given 10 units intermuscularly in a shot of oxytocin. Then the researchers weighed the pads that the women wore to collect blood every hour for three hours, and they found that average blood loss in the first hour was less in the dates group compared to the oxytocin group. On average, women in the dates group lost about 104 milliliters of blood compared to 142 milliliters of blood on average in the pitocin group. The second and third hours were not significantly different between the groups, but after three hours, the average blood loss in the dates group was significantly less than the blood loss in the pitocin group, 163 milliliters versus 221 milliliters. This was a small study, but they did find this preliminary data showing that eating dates after birth could decrease bleeding more than a shot of pitocin. Again, these are very preliminary results, and we need larger studies to confirm that. There was one observational study that looked at the effects of eating fruit in late pregnancy on labor and birth outcomes. This study took place in Jordan in a hospital, included low-risk women who were either having their first baby or subsequent baby and were at least 36 weeks. They just followed the 69 women who said they were eating six date fruits a day for four weeks starting at 36 weeks, and then they compared them to women who chose not to eat any date fruit during that time period, and they found that the date group was more likely to be more dilated when they came to the hospital. They were more likely to have spontaneous labor, 96% versus 79%, less likely to have pitocin augmentation, 28% versus 47%, and they had shorter early phases of labor. 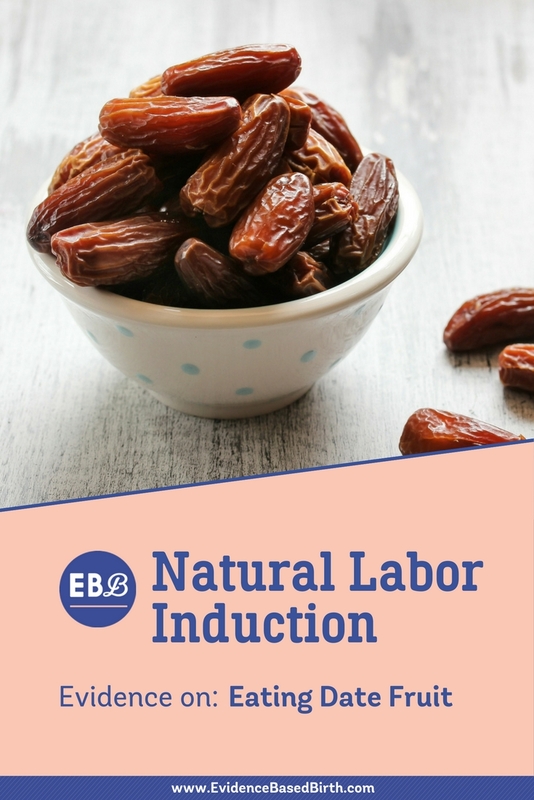 The early phases of labor for the date group were 510 minutes versus 906 minutes in the women who chose not to eat dates. Then there was another study that looked at 919 pregnant mothers in Iran to find out what kinds of natural methods they used, and they found that about 26% of women in the study used dates at the end of pregnancy. In summary, randomized trials have found that eating date fruit in late pregnancy, around 60-80 grams a day of fruit, may increase cervical ripening, reduce the need for a medical labor induction or augmentation, and one small study found a positive effect on postpartum blood loss. However, nobody’s looked at this in women with gestational diabetes, so if you have gestational diabetes, these results probably don’t apply to you. Also, these studies were small and they had limitations, including you can’t blind people. You know if you’re eating dates or not, so people in the research studies and the mothers may have known that they were eating dates, which may affect the results. It may lead to some bias, and we didn’t look at the women’s diets outside of the date fruit. In summary, it probably doesn’t hurt to dates as long as you don’t have gestational diabetes and it may actually help in these small studies that we saw. To learn more and subscribe to our newsletters for useful information, please visit evidencebasedbirth.com. Get a free crash course on evidence based care. By signing up you also gain access to free one-page handouts, our newsletter + more. Evidence Based Birth® is an online childbirth resource that informs, empowers and inspires expecting parents and birth-care practitioners globally, to understand the latest, proven, evidence based care practices.